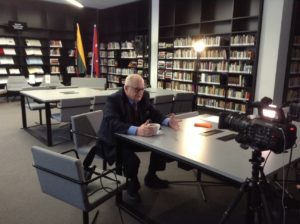 On January 17, Arvydas Reneckis, the director and producer of the American Lithuanian TV that ran in Chicago for 13 years, visited the National Library of Lithuania. Currently he works on a multi-part full-length documentary about Lithuanians and their history in the US. The guest was interested in the publications and manuscripts of American Lithuanians housed in the Library. During his visit, Reneckis filmed a few interviews for his new documentary. He interviewed Jolanta Budriūnienė, the head of the Documentary Heritage Research Department of the National Library of Lithuania, Prof. Alfonsas Eidintas, the ambassador of the Republic of Lithuania, Dr. Giedrė Milerytė-Japertienė, the head of the Lithuanian Studies Department, and Dr. Dalia Cidzikaitė, senior researcher at the Lithuanian Department. 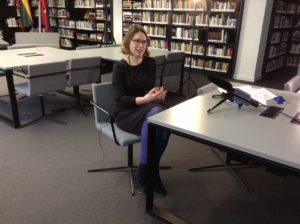 An interview with Dr. Giedrė Milerytė-Japertienė. An interview with the ambassador Prof. Alfonsas Eidintas. Photo credit: National Library of Lithuania.